* Judy Walker – Free Gift. – Make FUN earrings FAST! Judy Walker has been beading for over three decades, and she is well known for distributing lots of chocolate and buttons with funny sayings in her classes. Hundreds of former students just said, “Oh yeah, I had a class with her!” Judy is also known for her appearances in numerous books, magazines, touring exhibits, and galleries, and is a winner of the “Treasures of TOHO” contest. Judy has learned, through direct experience, that owning kittens makes it very difficult to accomplish any beading. She lives in Monrovia, California, with her husband, a large collection of beads, what might be too many cats and, of course, chocolate. We thank Judy for annually teaching our Fundamentals of Beading – Beader’s Boot Camp which, over a three-day period, has introduced many beginner beaders to the art and delight of beading stitches. Patience is definitely one of Judy’s virtues – and she really enjoys introducing brand new beaders to our art and passion. Thank you Judy! Melissa Grakowsky originated from and still resides in the rolling hills of Connecticut. She received a BFA in Painting and a BS in Physics from the University of Connecticut in 2006. Since then, she has discovered the world of beadwork and fallen in love with this art form. As the graphics coordinator for Beads East, she learned most of the bead stitches by writing beadwork instructions. Melissa’s work is featured on the cover of the April 2009 and December 2009 issues of Bead&Button Magazine. Her mask titled “Ceremonial Headdress” won 3rd Place in the Objects and Accessories category of the 2009 Bead Dreams Competition. Melissa is drawn to crystals, metallic beads, and contrasting colors. One of her primary design principles is to have some form of self-similarity on all scales, an idea pulled from mathematics and nature. Her website showcases most of her beadwork, as well as, older paintings and drawings: http://grakowsky.com. When you weave beads with loom, it will change to a silky and smooth touch fabric. Twinkle of beads makes beautiful art which will give us hope and happiness. Takako has been engaged in designing beads weaving craft materials for NHK Culture School for more than 30 years. She loved to draw pictures and make bead work from her early childhood, she won a number of awards from newspaper companies and societies. She was interested in Japanese culture since 8 years old, she has certificates of the Japanese flower arrangement and the art of tea ceremony, URASENKE. She thinks those experiences and environment from her early years inspires her bead weaving work today. From small accessory of 1 cm to a huge tapestry work more than 2 meters, in flat or three-dimensional works, Takako has introduced her work across the country every year since 1980. Awarded from the Ministry of Education of Japan, personal exhibition in New York/US, London/UK, and Dortmund/Germany. Beautiful selection of colors and ideas are her excel talent. Authored and published 12 books. Some are translated into English and French. With many of her fans, she is wishing to live in thankfulness, dream, and peaceful days with all. Jean Campbell is a designer and author who’s got a thing for shiny bright objects. She’s the senior editor of Beadwork magazine, has written and edited dozens of books on beading, and has penned articles for Beadwork , Stringing , Simply Beads, and Step-by-Step Beads . Jean is a Create Your Style Crystallized Elements Ambassador for Swarovski and is a contributor to Beading Daily. She has appeared on the DIY Jewelry Making show, The Shay Pendray Show, and PBS’ Beads, Baubles, and Jewels , where she gives how-to instructions, provides inspiration, and lends crafting advice. Jean’s work has appeared in numerous beadwork exhibitions, including Beadwork I: Up Close ;Beadwork II: The Embellished Shoe; Beadwork III: The Beaded Cloth; Beadwork IV: The Beaded Figure, and Miyuki Delica: Myths and Folktales. Jean teaches beading workshops throughout the United States. She lives in Minneapolis, Minnesota with her family and a whole lot of beads. See how to contact Jean by clicking here . Toshi Myoda works as a designer in the planning division of TOHO. 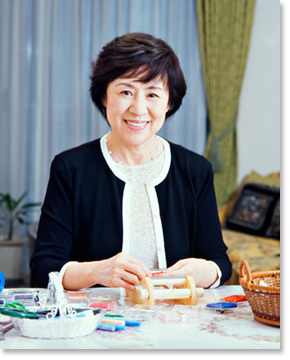 Her main tasks are designing kits for the Japanese market and inventing new materials for beading. Toshi designs kits ranging from children to the elderly, adopting the TOHO style. Her area of specialty is accessories. She has studied various kinds of techniques while attending the Bead&Button Show since 2004. Toshi, along with another designer from TOHO, developed the kits of off-loom work that was unknown in Japan at that time. Those kits are now in a series. During a class at Bead&Button in 2004, Toshi discovered the joy of doing macramé. Devoting her time to develop a way to introduce this new-found technique to Japan, Toshi created “2 Hour Workshops” of micro macramé for the Japanese hobby show, CREATE YOUR STYLE in May 2008, where all her kits were sold. On receiving the result of this respectable showing, Toshi helped with the development of a new thread, Amiet, that is suitable for macramé. Amiet was launched in the Japanese market in the summer of 2009. Toshi’s favorite designs are colorful, shiny, and fashionable, and she enjoys mixing those to create her own style. Laura has been beading since she was a child. Her mother, a very talented artist, taught her beading on a loom while sharing the importance of originality. Training in art, color, theatrical costuming, glass lampworking, metalwork, wirework, beading and communication have led Laura to teaching beadwork as art. Her extensive background in theatrical costume design has provided a great deal of related experience, especially in the area of color selection and tonal relationships. Favorite past productions include Costume Designer for “Cats” and Jewelry Designer for “Evita”. years. Laura had the wonderful opportunity to tour the Miyuki Shoji Bead Factory in Japan and train with a master instructor in Tokyo. She has had the honor of teaching for Toho. Japanese art and culture has provided her with tremendous inspiration, as have the long walks along a beautiful river near her home in Minnesota. Laura has been taking classes and now teaching at the Bead&Button Show. She has taught throughout the US and in Europe. As a recognized international instructor, Laura is eager to share her love of color, design and bead artistry. Laura Andrews, artist and instructor, using original designs to teach techniques and inspire. Her love for beautiful jewelry and a life long passion to create brought Marcia to beads in the early 1990’s. She designs colorful and fun to wear jewelry and shares her designs through teaching and publications. Marcia lives with her husband, Mark, in their San Diego Art Deco home which they share with Miss Maya Princess Angelina DeCoster, their lovable dog. Mark’s encouragement led Marcia to pursue her career as a full-time bead artist. She teaches national and international workshops in beadweaving. Her work has been published in Carol Wilcox Wells “The Art and Elegance of Beadweaving” and she was recently one of the showcased artist in “Masters:Beadweaving”. Naomi Sakuma is inspired by French Art Nouveau. She creates beads based on her own interpretation of “nature” and spends much attention and time on her color selection. Her works represent a mixture of Japanese color combinations and Western patterns. Her elaborate knowledge of color and some unique techniques have enabled her to create art pieces with depth from flat loomwork. Naomi enjoys Sadou (Japanese traditional tea ceremony) which she believes contributes to her sophisticated works. She studied general design at a college of art and design in Tokyo, worked in a jewelry firm, and studied metalwork in her twenties. While she was raising three children, she taught herself many handicrafts, such as paper clay art and rattan weaving, but none could satisfy her artistic interest. She started loomwork in 1998 and found it a perfect outlet for her artistic talents. Naomi studied loomwork at two bead craft schools in Tokyo and established studio MÉTIERS in 2001 where she works with two other bead artists and teaches classes. She was awarded the second place at the Beads Contest of Kinkado in 2003, and has been winning prizes at contests every year since.